No, not doubting the Thomas. Good morning everyone. It’s Wednesday! Ideally we would have scripting a preview for a MatchDay 10 clash with Warri Wolves but it’s not time to play them yet. Our eyes are Etoile du Sahel and a little matter of an encounter with them this weekend. So while everyone rakes up points, beats and gets beaten, we’re in the chest room sharpening our Arsenal for the Tunisians. I had a dream last night where a pitch was being installed for Enyimba in front of my house. It was a very good looking surface but it was coloured Navy blue. I think I saw Anaemena warming up urging the guy installing the pitch to hurry up and get it done with. When I woke up moments later, I checked my temperature to be sure I was really OK. I was. I am. Just a weird dream. Yesterday someone asked on Twitter. Why goalkeeper Olufemi Thomas always starts the season from the bench. The question took me by surprise, it caught me totally off guard really because I hadn’t even thought about that. Yeah I know he’s not played a lot (not more than once, I think) this season but I hardly considered it some norm before now. Well I needn’t even go dig up the archives to realize that the statement appeared true. Last season Coach Ikhana overlooked Thomas and went for Chijioke Ejiogu as his first choice goalkeeper. Ejiogu was in between the sticks for our Champions League games and Femi had to make do with a bench role. This was despite the fact that we ended the previous season with Femi firmly rooted in-between the sticks. Femi had to bid his time and his first major task was the State FA Cup finals which he, severely lacking match fitness, dropped a ball that Chikatara equalized from. That sent the game to penalties, which we won but that incident got him dropped. But he got his chance again after Ejiogu got injured and he reclaimed the starting spot in goal. This season also, the CHAN assignments ensured that ‘Safe hands’ Theo who joined us from Pillars was installed as the main starter and by the time Femi had returned, it was like the previous year all over- he would have to bid his time and start from the bench. So in response to that question, I think that while I may not be able to fully understand why, some have been sheer happenstance and neither the player nor the coaching ensemble had a hand to it. What you however would not deny is that Femi is a true professional. Whether or not he starts, he’s the first player to get fully kit for a game. He keeps his cool with interviews and you would never hear him whine or complain about playing or not playing. Tells a lot about his assuredness and confidence in his ability and the inevitability of his chance coming. He believes that he remains one of the very best in the country and he sure is, and that his time to play will undoubtedly come. 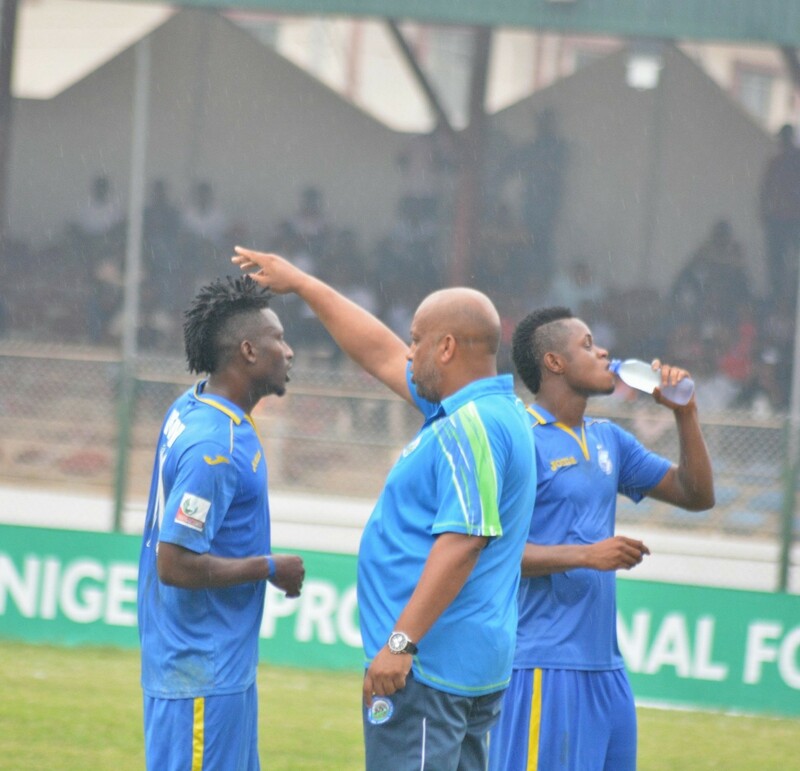 It is every player’s dream to play for Enyimba International. Every player wants to be part of the rich culture and glory that comes with Enyimba but truth is, Enyimba is no FC Taraba where you are assured of playing time week in week out. Look at our goalkeepers for instance. We have three or maybe four of the best in the Championship. So sometimes the question is, selecting the one who edges the others by the small margin. So when you are signing for Enyimba, you have not ‘arrived’ because your Enyimba career can be over before it even gets started if you are not careful. Ask someone like Ebenezer Odeyemi. Look at our strikers. Some of the very best as harvested from the nearby clubs. Look at a player like Alloy Brown for instance. He’s only a teenager but his second half display against Flying Birds on Saturday, similar to his performance against Akwa United last year in Uyo, he’s one for the future surely. You look at the rest of the guys, top top players who would get starring berths in any club in the Championship. What that says in effect is that when a player rarely sees games at Enyimba, it doesn’t mean he is rubbish. It just means there are quite a number of others who are also good in that position with whom he must battle with to play. It also means that no player can afford to go to bed knowing his position is guaranteed. I mean we won the title last season and our record goalscorer Mfon Udoh was injured for more than three quarters of it. The competition within the team keeps everyone focused and inspired to stake their claim for regular action when they get the opportunity. I think I prefer that this is the case within the squad than one whereby a player can afford to be rubbish week in week out knowing his position is guaranteed and undisturbed. There are some clubs like that. Do you want me to name names? Next postEnyimba vs Etoile rivalry: A little trip down memory lane.